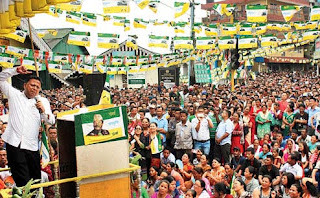 A Gorkha Janmukti Morcha leader addressed a public meeting for the first time today in Kurseong where the organisation had received a jolt following the departure of Bhupendra Pradhan. Anit Thapa, the undisputed Morcha leader in Kurseong, started his speech with a "Jai Gorkha" slogan and did not get into the customary mode of referring to other speakers. "Everyone is wondering what I would say. I haven't come here to deliver a speech but to make a promise," he said. "I have come here only to promise you that I will not step back from Gorkhaland (demand)," Thapa said and added that he had "happily gone to jail for six months during the last phase of Gorkhaland agitation (in 2013)". He urged the Morcha leadership to discard the GTA. "We have to discard the GTA for Gorkhaland. There will be challenges during an agitation but we must face them," said Thapa. "Trinamul will never be able to take control of municipalities as the people of Kurseong town will not accept Bengal's voice." He admitted that this was his first public speech and said he was not a great orator. "For nine years, I never spoke. Media personnel would always ask me and I always said I believed in work and not in speeches and I would speak when Gorkhaland was formed. However, the situation brought me before a microphone today," said Thapa. Thapa spoke for a little over 12 minutes, during which he sipped water five times - the first was when he was 2.45 minutes into his address, followed by sips at 3.28 minutes, 5.10 minutes, 6.17 minutes and 10.48 minutes. Thapa, a Morcha central committee member, decided to change from a stand-held microphone to a hand-held microphone 3.58 minutes into the speech. A towel was provided to him when he was 9.57 minutes into his speech. Thapa was elected to the GTA Sabha from Kurseong-Giddepahar unopposed in 2012. The Morcha organised the public meeting as a show of strength following Pradhan's switch to the Trinamul Congress on Wednesday.